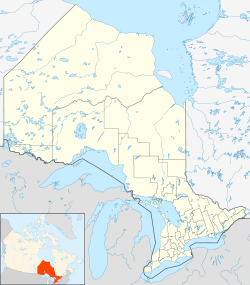 Ohsweken, (generally pronounced /oʊʃˈwiːkɛn/), is a village on the Six Nations of the Grand River First Nation Indian reserve near Brantford, Ontario, Canada. Approximately 300 of the 2,700 homes on the reserve are in Ohsweken, and it is the site of the reserve governmental and administrative offices. From approximately 1840 to 1865, the Six Nations Confederacy council met in a log building near Middleport, Ontario. In 1856, against protests from the Onondaga chiefs, a strong-willed superintendent from the Indian Department, Jasper Tough Gilkison, established a council building in what is present-day Ohsweken, about 6 km south-west of Middleport. Gilkison later retired in 1891 under pressure from Prime Minister Sir John A. Macdonald for incompetence. Though the Onondaga chiefs argued that they should establish their own center of government, the village of Ohsweken quickly developed in the surrounding area. This park is at the corner of Fourth Line Road and Chiefswood Road. It features The Six Nations-Mississauga War Memorial, which commemorates the 200 First Nations soldiers who were killed during World War II. The soldiers fought in Dieppe, France, and Hong Kong, and were part of the Normandy Invasion in 1944. The Gaylord Powless Arena seats 648 with room for 200 standing. Originally constructed in 1972, it was renovated in 2005 and is regularly used for lacrosse, hockey and figure skating. On Bread and Cheese Day, the arena serves for distribution of large chunks of bread and cheese. The Iroquois Village Plaza is a rented commercial property located in central Ohsweken on Chiefswood Road. It contains a bank (Royal Bank of Canada), restaurants and the CKRZ-FM radio station. Ohsweken Speedway is a 3/8 mile dirt oval raceway located in Ohsweken, Ontario, Canada. Races are held on Friday nights with regular events that include bombers, ministocks, thunder stocks, and 360 Sprint Car classes. The speedway also plays host to the ASCS Patriot Sprint Group, ASCS Sprints on Dirt, Empire Super Sprints, Southern Ontario Sprints, World of Oultaw Sprint Cars and the Canadian Sprint Car Nationals. Ohsweken Speedway was a former member of Dirtcar and had the Dirtcar Sportsman class as its headliner, but changed to 360 Sprint Cars for the 2008 Season. Six Nations Polytechnic is a Six Nations of the Grand River First Nation community-controlled, community-based human resource development center. Six Nations Annual Fall Fair takes place often the first week of September and is one of the oldest Agricultural Fairs in Ontario. Celebrations include the Miss Six Nations pageant, a powwow, horse races, and a derby. In appreciation of the Six Nations' support for Great Britain during the American Revolution and the War of 1812, Queen Victoria began an annual tradition of giving blankets to their community. The custom ended with Victoria's death in 1901. In 1924, however, the council of the Six Nations decided to revive the practice, this time with gifts of bread and cheese, as a commemoration of the close ties between Six Nations and the British Crown. Every year, thousands of people stand in line to enter the Gaylord Powless Arena where they receive large squares of bread and cheese. The celebrations also include carnival rides and games, a parade from Chiefswood Park to the arena, and a street dance held by CKRZ-FM. The events take place at Chiefswood Park, celebrating National Aboriginal day and the summer solstice on June 21. June 21 is also the day of the Tom Longboat run. There are also festivities at Gage Park in Hamilton. This annual Pow-wow, held since 1979, hosts over 400 dancers and drummers from across North America. It is held on the last weekend of July at Chiefswood Park. It features a variety of traditional Native dancing by different tribes, food, and crafts. The Elder Network is a network of people who serve the Elders of the Six Nations, and host various special meals such as a Wild Game Dinner in November, a Strawberry Social in June, and a Fish Fry in August. Most of the staff for these meals are volunteers. The town is serviced by two community newspapers, Turtle Island News and the Two Row Times. Both newspapers feature mostly local news but also include stories related to broader First Nations and Canadian issues. CKRZ-FM, a community radio station, broadcasts a variety of programming including local news, music, language lessons and radio bingo. ^ Getty, Ian A. L.; Lussier, Antoine S. (1983). As Long as the Sun Shines and Water Flows: A Reader in Canadian Native sSudies. UBC Press. ISBN 978-0-7748-0181-2. Retrieved 4 Aug 2010. ^ Handbook of North American Indians Volume 15. Smithsonian Institution. 1978. pp. 528–529. Retrieved 3 Aug 2010. ^ "The Sacrifices and Achievements". Native Soldiers - Foreign Battlefields. Veterans Affairs Canada. 30 Jun 2005. Retrieved August 2, 2010. ^ "Parks and Recreation - Gaylord Powless Arena". Retrieved August 2, 2010. ^ "Tradition draws thousands". Brantford Expositor. Retrieved May 19, 2015. ^ Maracle, Brian. Back on the Rez: Finding the Way Home. Penguin, 1997, p. 212. ^ "Powwow to feature hundreds of dancers". Brantford Expositor. Retrieved August 2, 2010.